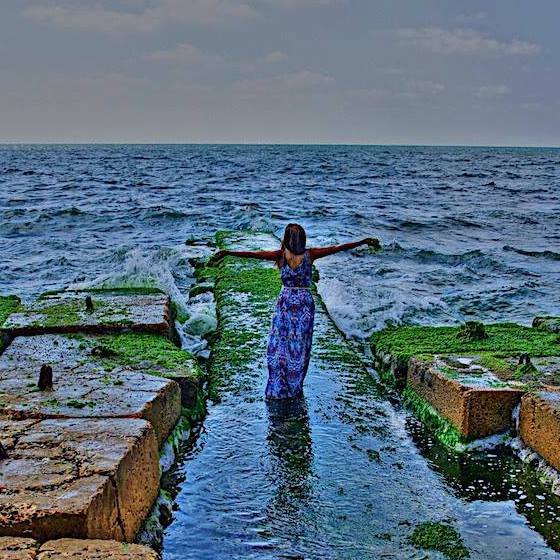 A Tale of Two Women Who Told A Story In Capturing the Mediterranean Sea in Alexandria, Egypt! Day trips have their own sense of humor, don’t they? You never know where they’re gonna’ take you. The end surprises are a mystery. What initially planned to be a meeting for a doula conference, (the finalizing for an agreement in a partnership on doula work between an Egyptian woman gynecologist, and my dear colleague Karen Flowers), led to further adventure, after conclusion of the meet up. Alexandrian waters guided our footsteps in this ancient town. We were brought forward towards the coast, observing her body, and the wonders of her presence. The rocks were a source of tranquility from the excitement, performed by the waves. The Mediterranean danced vivaciously, and a humorous dance, indeed. Playful and enjoying the surprised intervals between dances. Being the passionate eye of photography that she is, Karen proposed that we go out, and instill my image with an emerald-sapphire palette, called. . .the sea. In layman’s terms, we were going to do a photo shoot. But when you are so in tuned with the sonnets of waters, a 3-syllable word cannot suffice. If one were to observe the series of captured movement (By Karen Flowers) on that day, the story of a young mermaid’s fruition. . .comes into play. Arising from the waters, covering a hidden paradise, she has discovered. . .Earth. This mysterious body of land she discovered during her many adventures of swimming through, nature’s crafted painting of emerald-colored pearls. One of the secrets, unbeknownst to her, is that once you arrive on Earth, you take on human form. Embracing fascination in this new body, she languishes in time to experience this Being. . .called woman. The idea of nature above water is a curiosity to her. Gliding her hands through the fabric of seaweed, these rubber tresses gave meaning and life to rocks. Yet, even above water, the sea saw her as familiar. They always recognize water maidens, and those who habituate under the sea. Excited, they rise higher, hoping to find favor, with her presence on Earth. Hoping to be a reminder of her natural habitat. As waves sang praises for the delight of underwater nature, the orchestra had taken its place. Through every movement, the sea followed the mermaid. She had not been used to walking with human feet. Balance became a major challenge, while maneuvering down slippery walks of hardened sculptures. Nevertheless, the sea guided her footprints. Hidden footprints only visible to a mermaid’s eye. Invisible glitter sprays across her existence-serving as kisses for her bravery, in discovering a new world. Singing higher, and with great ferocity than ever before, the sea cannot contain her excitement. A marriage has happened between water and land. A celebration of the heavens, as the stars blink in wonder. Adorned in fashion of the sea, the wind dances through her. Observers from afar watch with curiosity in the art being. . .created. The photographer waves her wand to collect showcased memories. And women, are once again, reminded of their natural affinity to water. It’s always grand to recall this sacred treasure, knowing and experiencing the healing power of water. Water has a character of her own. Always testing humanity’s loyalty and care of her existence. Recognizing her maidens instantly, she rewards them. They will continue her music, and perform her sonnets, forever. . .and ever more. Moments passed, and the time of dancing with rocks, came to an end. Hidden illustration of the story shows the mermaid going with a human mother to partake in the nourishment of lunch. Wondering eyes continued to invoke their curious nature. A young, Egyptian male, had assisted in crafting the story by guiding the mermaid onto rocks, and retrieving them, afterward. Beauty was born. And as two women prepared for departure, walking forward, the sea painted their shadows. Two women artists, with yin and yang dynamics, who captured tales of singing with seas.